Today is the biggest day of the week for events. 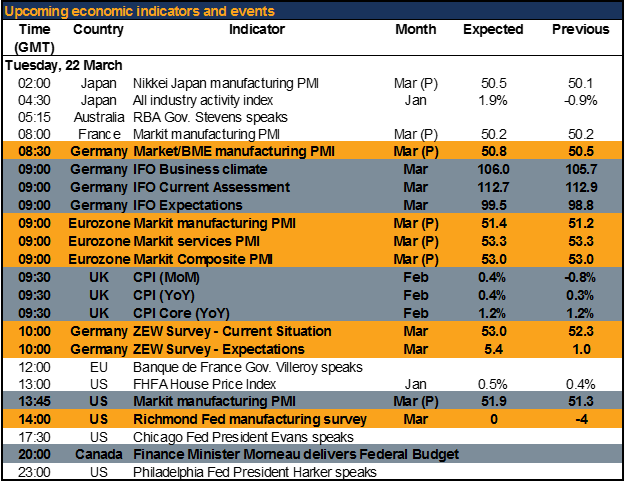 In the first instance, the preliminary Markit PMIs from several of the major countries – including Japan, Germany, EU and the US – are released. 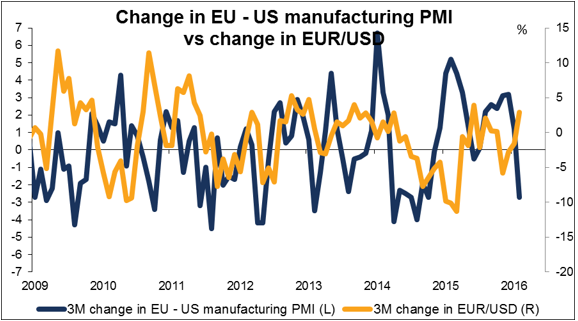 They are expected to show a modestly accelerating expansion in manufacturing for both the EU and the US, which could weaken EUR/USD slightly, in that a healthy global economy would make it more likely that the Fed goes ahead with tightening policy. However the relationship between the two indices on the one hand and EUR/USD is not that robust, as the graph shows. 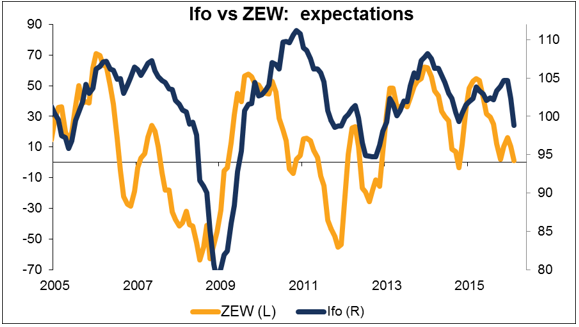 Unusually, the IFO index and ZEW survey will be released on the same day, giving a very detailed view of the German economy. The indices have been trending lower although they are still showing some expansion. The key point for tomorrow though is that the expectations indices are expected to move higher and those are the ones that are important for market expectations. Trades should be aware of the possibility of some market volatility if these various indices diverge and cause some confusion about what’s going on. Also remember that the US index comes out after the European ones and could cause some reversal.